Trade unions from around the world have called on the French-based Accor Group to immediately enter into negotiations to redefine the scope and content of the international trade union rights agreement signed with the IUF in 1995. The call came from the IUF's annual global meeting of member unions in the hospitality, tourism and catering sectors, which was held in Ankara, Turkey May 17-18. Strike action scheduled to begin at 19 hotels in Sweden's 3 largest cities on early morning May 17 has been averted with the conclusion of a new 2-year collective agreement between the Swedish Hotel and Restaurant Workers' Union (HRF) and the employers association. The conflict had gone into mediation as the strike deadline approached and other unions had announced active support measures. Iranian teacher union activist Farzad Kamanger was executed in Tehran's notorious Evin prison on May 9, together with 4 other political prisoners. The families have not been allowed to claim their bodies. Teachers' unions, the IUF and other international trade union organizations, Amnesty International and other human rights groups had campaigned for his release following his 2008 conviction on ludicrous charges of "endangering national security" and "enmity against God" in a mock 5-minute trial. Kraft Responds to Post-Cadbury 'Agitation' with…Surveys? Anyone following the UK parliamentary enquiry into the takeover of Cadbury by Kraft could not help but conclude that Kraft was either less than truthful, or incompetent, or both, in its cynical manipulation of false hopes around the Cadbury Somerdale plant previously slated for closure (see Kraft on a Diet after the Cadbury Feast - How Many Union Jobs Lighter?). Read more about Kraft Responds to Post-Cadbury 'Agitation' with…Surveys? Since April 21 hundreds of workers at the Horlicks factory in Nabha in Punjab state in northwest India, have held continuous protest actions against the company’s refusal to grant permanent employment to casual workers employed on a 'temporary’ basis for more than a decade. Workers in the cane-based sugar sector in Kenya face substantial safety and health hazards. Companies historically have shown a lack of concern about occupational health and safety (OHS) and this has been worsened by casualization and outsourcing, which put a great proportion of the sugar labour force at risk. Representatives from seven global union federations, plus the International Confederation of Trade Unions (ITUC) and the European Confederation of Trade Unions (ETUC), will meet with various affiliated unions in Turkey on the eve of International Workers’ Day (May Day). May Day, which began in the struggle of US workers for the 8-hour day, has been celebrated around the world since 1890 as International Labour Day. Its force lies in its global character: it is the day when workers around the world announce their commitment to struggle together for common goals. IUF affiliates UNITE-HERE, the Teamsters (USA) and the NGG in Germany, together with the public services union Ver.di, are calling for international support for their members facing difficult negotiations at LSG SkyChefs and Gate Gourmet, the largest global airline catering companies. On April 28, Remember: 'Zero Accidents' Can be Hazardous to Your Health! Read more about On April 28, Remember: 'Zero Accidents' Can be Hazardous to Your Health! The German Food and Allied Workers (NGG) have secured an agreement with Coca-Cola's German bottler Coca-Cola Erfrischungsgetraenke AG (CCEAG) that provides extensive guarantees on job security. CCEAG, with 11,000 employees, is Germany's largest soft drink producer. 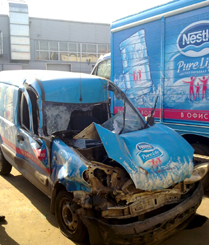 Three Delivery Accidents in One Week at Nestlé Waters Russia - Nespressure, What Else! Read more about Three Delivery Accidents in One Week at Nestlé Waters Russia - Nespressure, What Else! Nestlé Indonesia Continues to Deny SBNIP Wage Bargaining Rights! Read more about Nestlé Indonesia Continues to Deny SBNIP Wage Bargaining Rights! Dismissed workers from the 5-star Bandung Grand Aquila Hotel have walked nearly 250 kilometers to seek a meeting with the president of Indonesia, and are still waiting to hear if the country's leader is prepared to enforce Indonesia's legislation which makes union-busting a criminal offense.